The platform le peuple qui manque (a people is missing) presents a film screening dedicated to the “ethnographic turn of art” according to the American art critic and historian Hal Foster (1995), pursuing the pioneer works of Michel Leiris between poetry, art and ethnography. 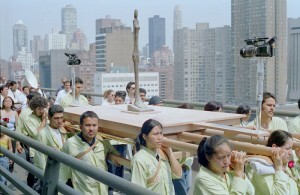 The Modern Procession, organized by artist Francis Alÿs (b.1959, Antwerp, Belgium) and presented by the Public Art Fund in collaboration with The Museum of Modern Art, is modeled after a traditional ritual procession. Beginning in front of MoMA at 53rd Street and Fifth Avenue at 9am, the procession parades through midtown Manhattan, crosses the Queensboro Bridge into Long Island City, marches along Queens Boulevard, and ends at the door of MoMA QNS (33rd Street at Queens Boulevard). Both festive and ceremonial, the procession makes the museum’s historic transition both visible and public, linking the two boroughs in a spectacular and memorable way. A 12-member Peruvian brass band, Banda de Santa Cecilia, sets the pace for the procession. 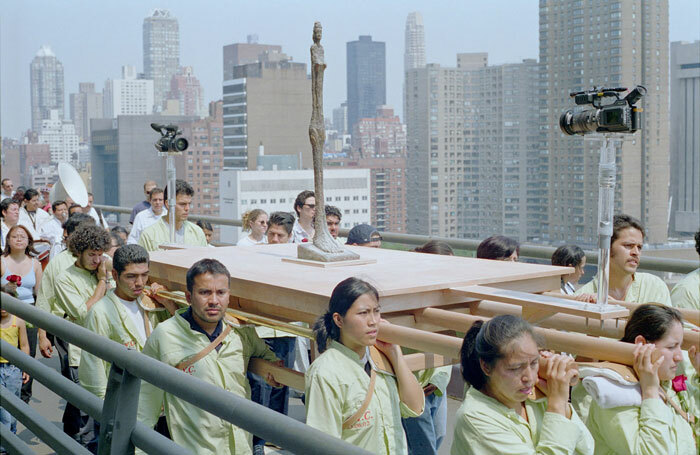 More than 150 uniformed participants carry reproductions of MoMA’s most famous works—Pablo Picasso’s Les Demoiselles d’Avignon, Marcel Duchamp’s Bicycle Wheel, and Alberto Giacometti’s Standing Woman—on handheld wooden carriages. The presence of these reproductions pays homage to the history of MoMA while celebrating the cultural and economic potential of bringing art into the streets. Artist Kiki Smith serves as a representative of contemporary art. Carried by fellow participants, Smith leads the spectacular procession, which also includes banners, dogs, and scattered rose petals. The film ‘Episode of the Sea’ is the outcome of a two-year collaboration with the fishing community of Urk, a former island in the Netherlands. In the previous century, the Dutch closed off and drained their inland sea to reclaim new arable land. The island of Urk, situated in mid sea, suddenly found itself embraced by land. Its inhabitants were expected to switch from fishing to farming, but the fishermen managed to continue their trade. They found new fishing grounds, far out in the North Sea. Despite being part of the mainland for decades, the fishing village is still notoriously insular and its inhabitants continue to speak their own tongue. With a residency and numerous visits to Urk we gradually gained the Urkers’ trust. From 2011 to 2013, we documented the sites and work of fishing and filmed a dozen of staged scenes, performed by members of the fishing community themselves in their local dialect. Meanwhile we kept a log of our encounters and experiences in situ. ‘Episode of the Sea’ brings these diverse materials together. The film documents the material world of contemporary North Sea fishery and the fishermen’s struggle with a changed public perception, fluctuating regulations, and excessive global competition, while parallels are drawn between fishing and filming. 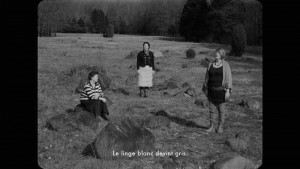 Rendered in black-and-white to recite neo-realist drama and early documentary styles, the scenes evoke a way of life that has been passed on by ancestors, yet on the verge of obsolescence. The Visitor is a photo-essay of the artist’s audience with Oba Erediauwa, the current king of Benin. A local narrator follows the artist into the Oba’s palace and recounts the conversation between the European visitor and the royal host and his court of chiefs. The exchange centers on the Benin Bronzes (famously looted by the British in 1897 and now in over 500 museums and collections worldwide), collective memory and the demand for restitution. However, communication remains somewhat elusive, slipping in and out of gaps of cultural and historical difference. The isolated people of Nagorno-Karabakh are living in a time vacuum since the cease fire of 1994. 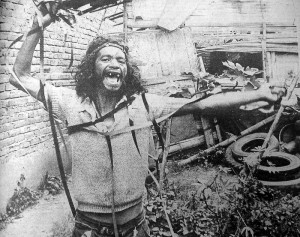 They live in a de facto independent country, but remain unrecognized as such by the international community. This area is still subject of an unresolved and long forgotten conflict which resulted from the collapsing Soviet Union. Then what does national identity mean in a country that doesn’t exist? What are the concepts to construct such an identity? Isn’t a nation an artificial construction after all? And how is the landscape an object of identification, to them, and to us, the viewer? ‘The Nation’ examines the relation between identity and the mental and physical land. 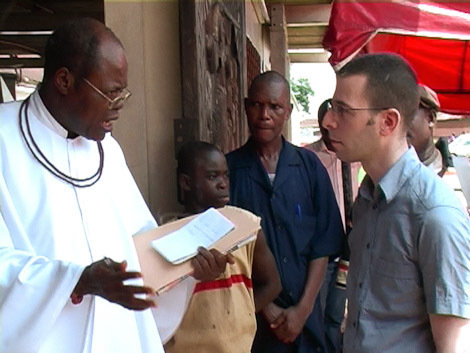 Episode III, also known as ‘Enjoy Poverty’, is the 90 minute film registration of Renzo Martens’ activities in the Congo. In an epic journey, the film establishes that images of poverty are the Congo’s most lucrative export, generating more revenue than traditional exports like gold, diamonds, or cocoa. However, just as with these traditional exports, those that provide the raw material: the poor being filmed, hardly benefit from it at all. Amidst ethnic war and relentless economic exploitation, Martens sets up an emancipation program that aims to teach the poor how to benefit from their biggest resource: poverty. Thus, Congolese photographers are encouraged to move on from development-hindering activities, such as photographing weddings and parties, and to start taking images of war and disaster. With a neon sign, packed in metal crates and carried through the jungle by Martens’ porters, the local population is encouraged to capitalize on what the world has given them as their share. It states ‘Enjoy Poverty.’ Hapless plantation workers question it, accept it, dance around it, yet in the end, the whole project seems bound to fail. 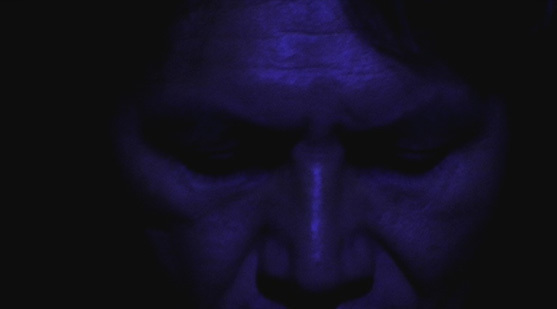 The piece is the third in a series of films that, by enacting their own parameters, try to make visible their own complicity in a world obscured by depictions of it. The first of this series was ‘Episode I’ set in Chechnya. 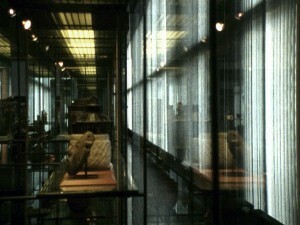 Episode III was first shown at the Stedelijk Museum Bureau Amsterdam. The trunks that were carried throughout the jungle, now contained the master-tape of these activities, some left over neon lights, a photograph made in collaboration with the Association des Photographes de Kanyabayonga, and a certificate. The film was screened a few times daily. On the very same day, the piece served as the opening night film the Amsterdam International Documentary Festival’s 2008 edition. Ever since, the film has been shown in over 40 filmfestivals, art venues including Centre Pompidou, ZKM Karlsruhe, Kunsthalle Goteborg, Tate Modern, Arnolfini Bristol, The BOX LA, Nomas Foundation and art biennals such as the Moscow Biennal, Berlin Biennal and Manifesta. Travelling Amazonia was shot in the heart of the Amazon jungle. The film’s narrative is concentrated on the Trans-Amazonia highway, a massive project devised in the seventies by the Brazilian government to establish a route that would bisect the Amazon forest and connect the Atlantic and the Pacific coasts. The objective of Hugonnier and her team is to build a dolly and tracks using the same materials that were employed when building the highway. The construction of the Trans-Amazonia generated an industry around the extraction of natural resources like metal, wood and rubber. Hugonnier and her team make use of these materials to realise upon the very same road a ‘travelling shot’. 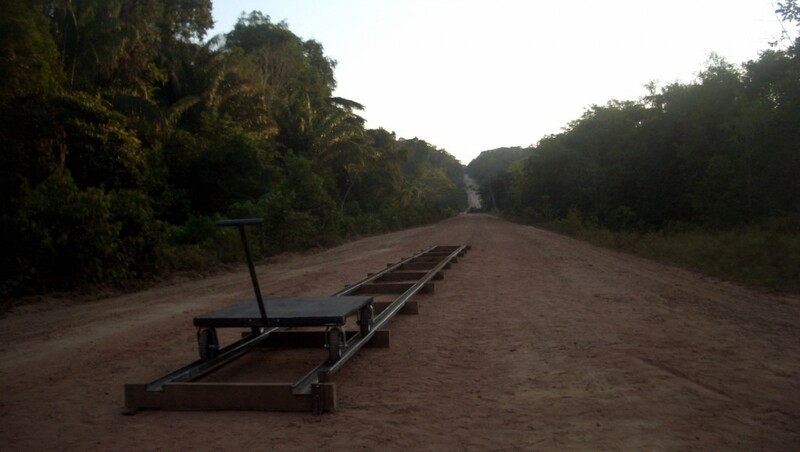 The purpose is to film a linear travelling shot which re-enacts the linearity of the Trans-Amazonia highway and which recalls the pioneering ideals that this colonialist project embodied. Travelling Amazonia questions the idea of perspective and its consequences for Western systems of representation. 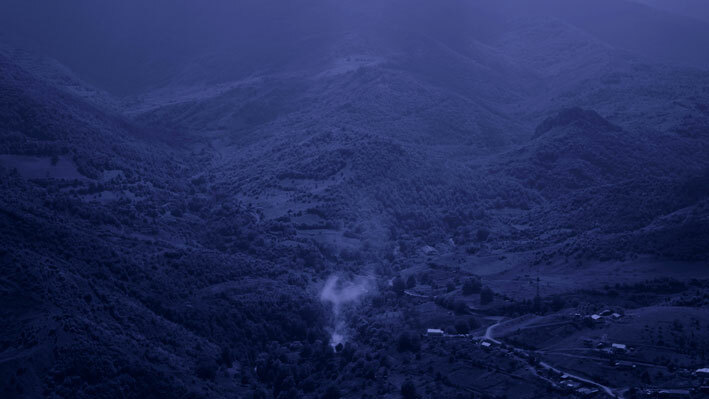 Ariana investigated the relationship between landscape and history. 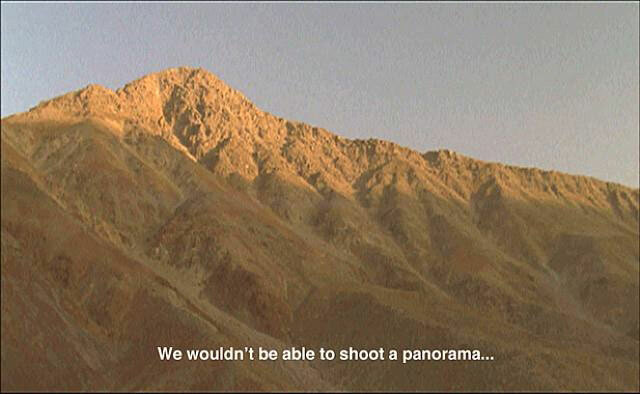 It explored ideas of utopia and resistance, questioning the tools of cinema and western ideas of viewpoint and panorama. Recorded in Afghanistan during 2002, Ariana details a journey to the capital Kabul, and to the beautiful Pandjshêr Valley, a region that has historically resisted the invasions of Soviet and Taliban ideologies. 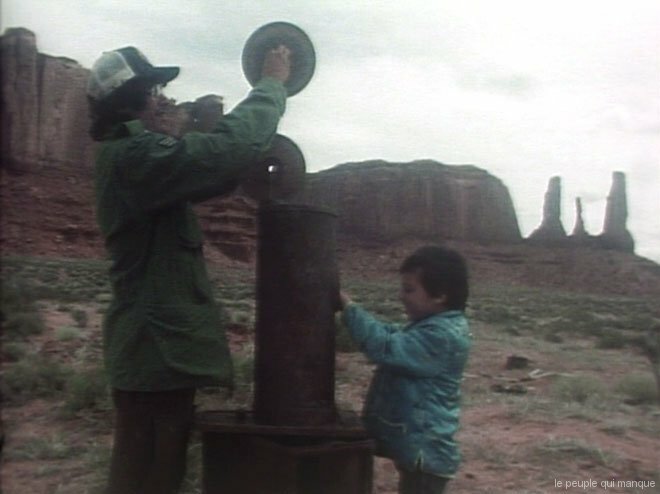 Hugonnier’s 16mm film charts the journey of a film crew. On arriving in the Pandjshêr Valley, their intention is to investigate how the landscape has determined the region’s history. To do so, the crew attempts to find a vantage point to record a panorama of the entire valley. Access to this viewpoint is refused, because of its strategic value and the crew returns to Kabul to record the ruins and traffic of the city. The crew obtains permission to shoot a final panorama. The view allows them to gaze over Kabul and across to the Hindu Kush Mountains. They realise that this spectacle gives them a feeling of euphoria and totality. They decide to stop filming. « Dans Ethnologisches Museum, réalisé en 2009 dans le musée ethnologique de Dahlem, Alexandra Leykauf – qui travaille d’une manière générale sur les rapports entre architecture, film et sculpture8 – cherche par le film à arracher l’objet à sa temporalité muséale. Elle montre les objets suspendus, comme flottant dans l’air, coincés entre les lamelles transparentes des vitrines très réfléchissantes qui fonctionnent comme des masques autant que comme des présentoirs. Ces images évoquent précisément un passage du Problème de la forme dans les arts figuratifs d’Adolf von Hildebrand9, sculpteur et théoricien de la sculpture de la fin du xixe siècle. Dans le cinquième chapitre de son ouvrage, intitulé « La saisie du relief », il explique que pour produire un effet de profondeur à partir de la surface, il faut que le spectateur imagine que l’objet, placé sur un fond plat, est installé entre deux lamelles de verre transparentes – la lamelle la plus éloignée du spectateur touchant l’arrière de la figure, la plus proche touchant sa face antérieure. Une fois ce dispositif mental mis en place, l’effet de profondeur se produit dans la bi-dimensionnalité. Or Hildebrand affirme que cet effet de profondeur est à l’origine du mouvement : le creusement de l’espace est dynamique. Lorsque les artistes transforment le film en espace muséal ou en collection, ils n’injectent pas du mouvement dans les œuvres conservées dans les vitrines des musées, mais arrachent celles-ci à leur durée objectale. » Philippe-Alain Michaud, Le film-musée : un changement de durée. in Érik Bullot, Angela Dalle Vacche, Philippe-Alain Michaud et Hervé Joubert-Laurencin, « Cinéma et musée : nouvelles temporalités », Perspective, 1 | 2011, 523-533. 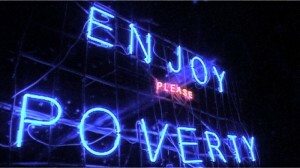 At the invitation of Centre Pompidou Metz and Mathieu K. Abonnenc, artist featured in the exhibition Leiris & Co. Thanks: the artistes, galleries, owners and Centre Pompidou Metz (Géraldine Celli, Thibault Leblanc), Mathieu K. Abonnenc, Joaquin Barriendos, LUX Distribution (Matt, Alice Lea), Gallery Luciana Caravello (Luciana Caravello, Julia Vaz), André Bijma, Kees Jaarsveld, Charlotte Van Buylaere, Galerie Fons Welters, Jérôme Baron, Emmanuel Gibouleau.